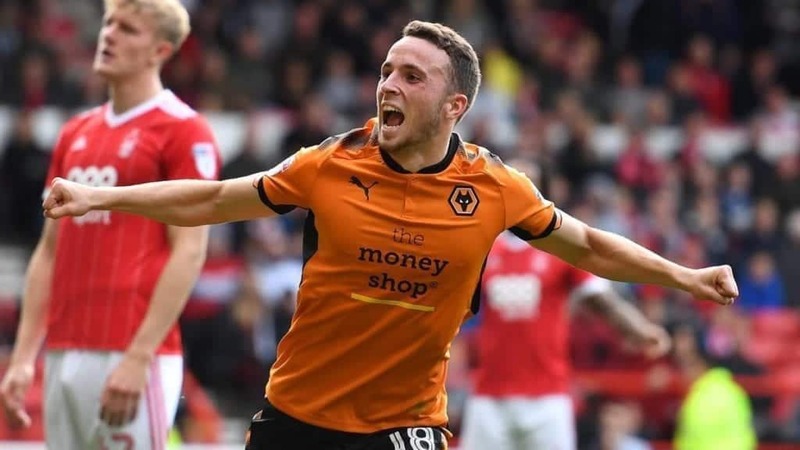 After some early season struggles, where he showed glimpses of his unquestionable talent but toiled for consistency while adapting to the rigours of the Premier League and battling injury, it’s been positive to see Diogo Jota cutting a revitalised figure. Interestingly, his upturn in form has largely coincided with Nuno Espirito Santo’s change to a 3-5-2 formation, which has seen Jota move from the wing to take up one of the two centre forward berths. Having been goalless in his first 13 Premier League matches for Wolverhampton Wanderers, Jota now has five goals and two assists in his last six matches in all competitions, including a sensational hat-trick against Leicester City, an invaluable goal vs. Chelsea and an assist in Wolves’ win over Liverpool in the FA Cup. Although all of his contributions haven’t arisen when operating in this striking role, he’s certainly looked very dangerous upfront. “It has not been a easy season for me but this was one of the greatest days of my life,” he explained after the Leicester match last weekend. Coalescing beautifully with fellow forward Raul Jimenez, the duo have shown a tidy understanding with one another, as they’ve balanced each other’s movements, supported one another and been a real nuisance for their opposition. When one drops, one will usually push higher, with these opposite movements not only maintaining depth but also causing dilemmas for opposing defenders on who should mark who. Moreover, by often remaining in close proximity, they’ve effectively ensured they don’t get too isolated so they can link up and connect attacks. Prime examples of this have been seen when Jota pushes near Jimenez to either be nearby to receive a lay off or a headed flick on or nod down. Jota’s intuitive and instinctive movement has seen him embark on some wonderful runs in behind, with the timing, angling and directing of his runs being spot on. A master at exploiting the pockets in between defenders and gaining separation by catching them off guard with a clever decoy or when their attention goes towards the ball, he’s targeted his runs shrewdly on the shoulder of the last man to breach in behind. Another key factor, is how he’ll start his run on the blindside of his marker, so he’s more favourably oriented to latch onto passes and can use his dynamic advantage over his more awkwardly oriented tracker, who will lose valuable time recalibrating their posture. In situations where Jota is inside the box, his nous, anticipation and ability to rapidly read the ball’s trajectory has meant he’s been able to react sharply to latch onto crosses and cutbacks ahead of his man. Adept at dropping in between the lines and performing subtle rotations with his colleagues too, Jota’s positional awareness and knowledge of how best to use space has been first class in terms of generating openings for himself and others. Technically excellent, the silky skilled 22- year-old’s dribbling has been a real feature of his armoury, for he’s used his nifty adjustments in pace and direction, plus tidy array of feints, shimmies and shoulder drops to shine in 1v1 duels. So comfortable on the ball and resistant to pressure, his decision making importantly is still great despite the attention of his opposition, thus allowing him to execute cleanly and provoke his adversaries into pressing actions that can generate a free man ahead. Possessing a tidy first touch and ball control, this has only enhanced his capacity to link play with his back to goal and maneuver himself in tight spaces to progress Wolves’ attacks. Vitally, his underrated strength and low centre of gravity has helped him handle himself admirably while holding the ball up, making him challenging to outmuscle or knock off the ball. Creative in his passing and always wanting to make something happen, the Portuguese maestro’s aptitude here has added another element of incision to his team’s forward forays. Meanwhile, on the defensive end, the diminutive attacker’s led Wolves’ pressing strategy notably, with his fearless and physically imposing approach never allowing his intended targets an easy touch. Full of tenacity and always keen to get stuck in, he’s a fantastic embodiment of his manager’s philosophy in this regard. Jota has displayed his intelligence in this phase too, as he knows the precise moment when to drop back into a mid block or when to mark an opposition’s central defender or holding midfielder. Alternating astutely between responsibilities and showing the smarts to block passing lanes when he applies pressure, he’s definitely parlayed physicality with smarts in his stopping exertions. Statistically speaking, Jota has accentuated his quality by recording 3.95 dribbles per game, embarking on 2.44 progressive runs pg, having 1.08 shot assists pg, hitting 1.2 key passes pg and chiming in with making 6.7 defensive actions pg. Even though it took him some time to adapt to life in the massively demanding Premier League, it’s been encouraging to see him now playing at a level closely resembling his best. Confident, fully fit and firing on all cylinders, the wildly talented Jota looks primed to a huge asset to Wolves in the second half of the season.